Masuda-san is the young lady on the cover of this magazine. “The first time I came to Akihabara—we all call it Akiba—I was in elementary school. That was around the time when the new maid and cosplay subcultures were developing from online and video games. Each time I came here I liked it more. That’s why, two and a half years ago, I took this job, working for an office that gives Akiba tourist information for free. My work lets me express my love for Akiba, and tell people about all the things here, everything from animé to electronic products. That way I can help my Lords and Masters, and their Ladyships, too, of course, enjoy their Akiba tour. I’m talking about all of the kids and adults—some from overseas—that I guide. Our office also organizes paid tours every day. We show them places of historical interest and the latest fad spots. there’s lots to see here. We can also arrange special guided tours to meet the wishes of our masters and their ladyships. 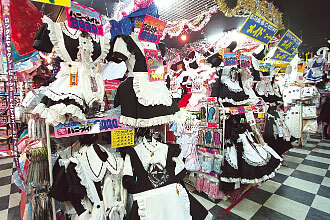 Top: The Don Quijote Akihabara store has a big selection of maid costumes. Above: At the Candy Fruit☆Strawberry cosplay café, one of the staff performs card “magic” (left). Do you have a secret desire to become a character from the fantasyland of animé and video games? If you do, join the cosplay crowd. Akihabara has lots of cosplay cafés where the staff dress up in costumes and take on a fantasy persona. One café, called Candy Fruit☆Strawberry, offers their female customers a most unusual costume experience. “Couples come here, too. Typically, the guy has his favorite female animé character in mind, and he gets his girlfriend to put on the costume,” confides one of the staff, Nekomura Nagisa. The café stocks over a hundred costumes, and female customers often try them on, with cameras flashing left and right. Or you could buy a costume. Don Quijote Akihabara is the largest outlet, and prices are reasonable. They stock more than 1,400 costumes on one of the store’s levels. It could be that cosplay is something anybody can enjoy.